With the ski season already here, we’re focusing on ‘chalet-chic’ style this month. 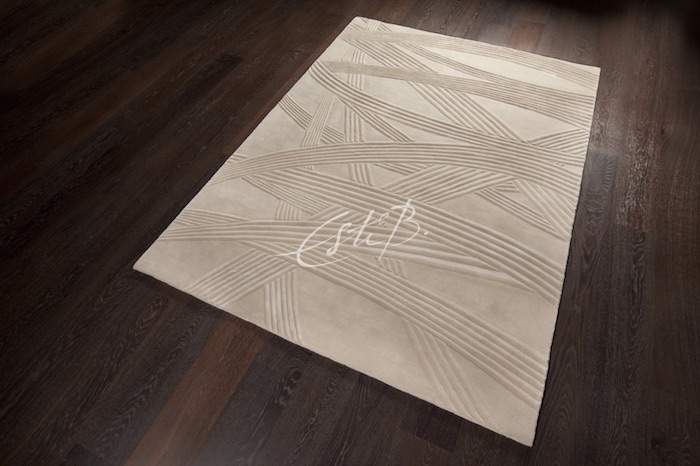 With an emphasis on natural materials, simple colour palettes and rich textures, our handmade rugs work well with both traditional and more contemporary interiors. TOPFLOOR has a wide range of bespoke hand-tufted, hand-knotted and hand-woven rug designs that will complement any winter scheme perfectly. 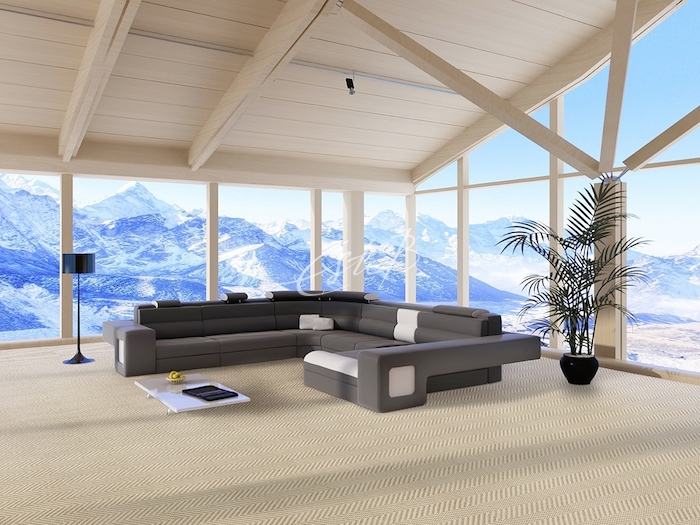 Mountain homes need luxury flooring, but above all comfort and warmth. Designs in white and other pale hues make a room feel brighter and work well with natural materials such as wood, leather and stone, which tend to feature strongly in chalet interiors. They also reflect the winter landscape – TOPFLOOR’s prize-winning ESQUIRE, with its hand-sculpted surface, brings the surrounding peaks straight into the living room. The textured surface of EROSION reminds us of the ripples of a snow drift, while ELM makes us think of the snow-covered branches of a fir tree. 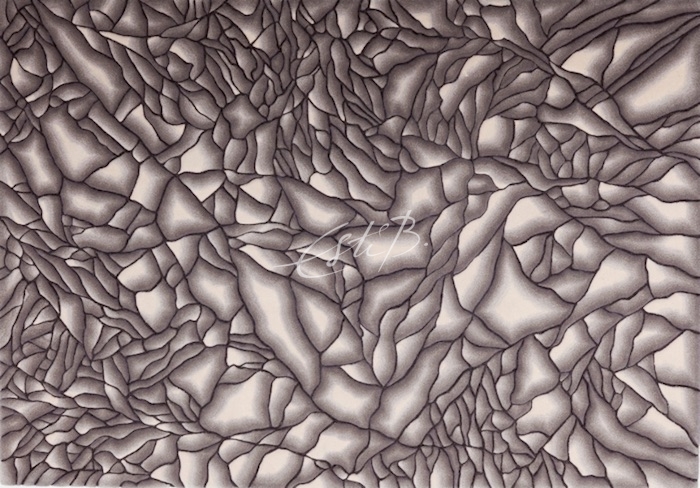 Another of TOPFLOOR’s most popular hand-tufted rug designs is EVERLASTING, which, with its swooping curves, fits right in with the ski slopes outside the window. When it’s dark and gloomy outside, the soft, velvety surface of a handmade designer rug seems even more inviting – almost like it’s calling you to kick off those ski boots and hunker down in front of a roaring fire. 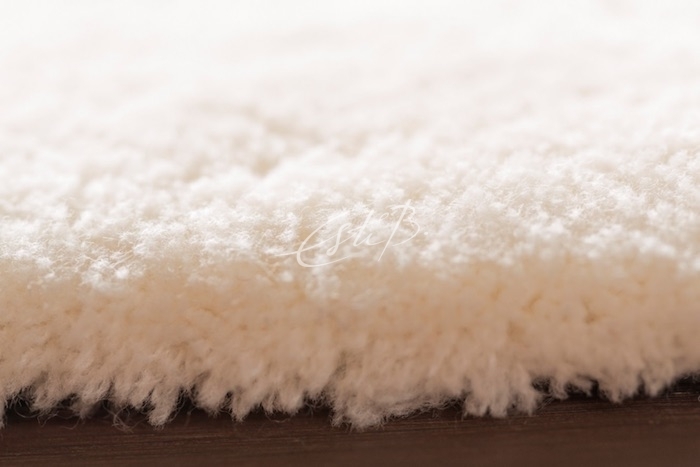 Our take on the perfect chalet look is ‘rustic luxe’, which calls for super-soft, natural yarns such as mohair, Merino wool and silk, like TOPFLOOR’s ROMA rug in pristine snow white. At the top end, chalets are morphing into small luxury ‘hotels’ for individual families and friends. This has driven demand for a sleeker, more streamlined style for which TOPFLOOR’s collection of hand-woven alpaca rugs is perfectly suited. 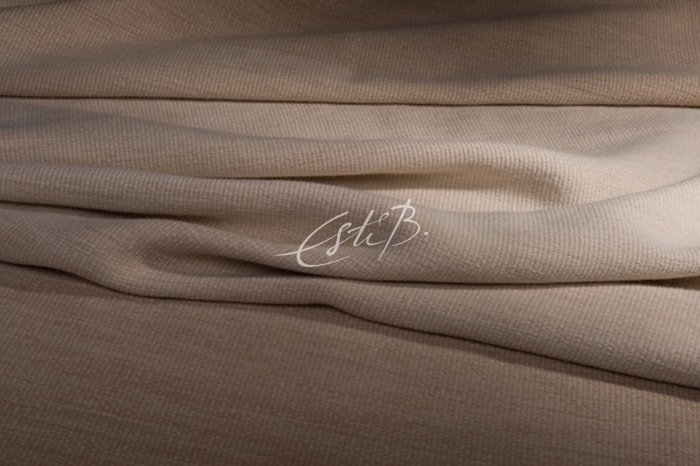 ‘FLUX is proving popular because it is hand woven from alpaca fleece, which is soft, luxurious and even warmer than wool, but the flatter weave provides a more “minimalist” finish,’ says Esti Barnes, Founder of TOPFLOOR. Whether you take a traditional or more contemporary approach to the ‘chalet-chic’ look, it’s a fair bet that wood will be a key feature. 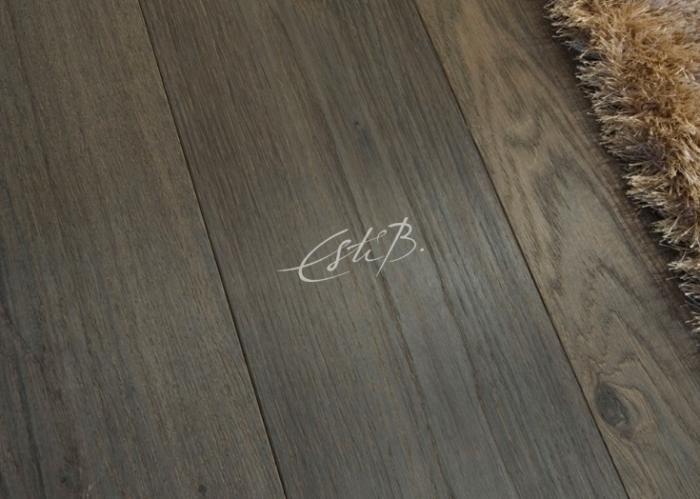 TOPFLOOR’s range of engineered wood flooring comes in a wide variety of formats and finishes, from rustic boards to Scandi-style blond woods, so there’s something to suit every taste. What’s more, it can be installed over underfloor heating, ensuring toasty toes even in the depths of winter! We’re noticing a growing trend for using wood on walls at the moment – it is perfect for the alpine look, bringing an organic feel to a scheme. 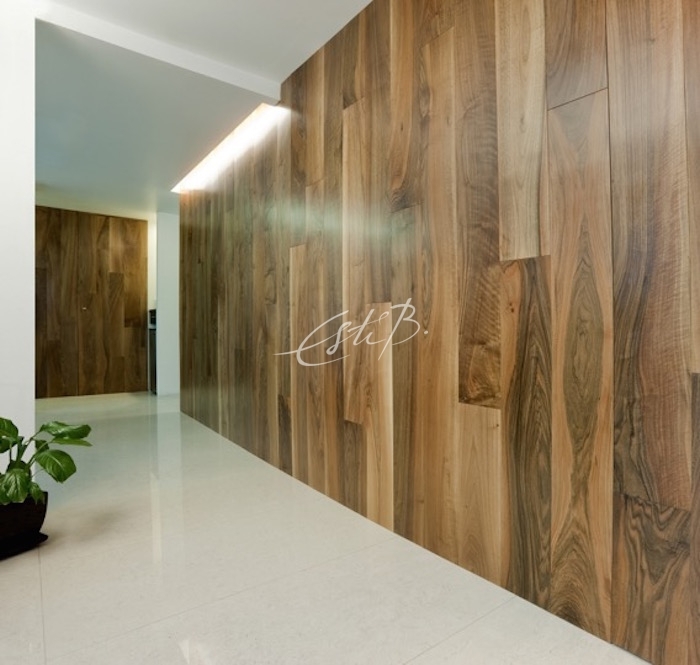 The beauty of wood’s natural grain pattern adds interest and textural detail, making walls a real focal point. This gorgeous walnut is smooth and sophisticated; rustic boards would bring a totally different but equally stylish aesthetic to your space. 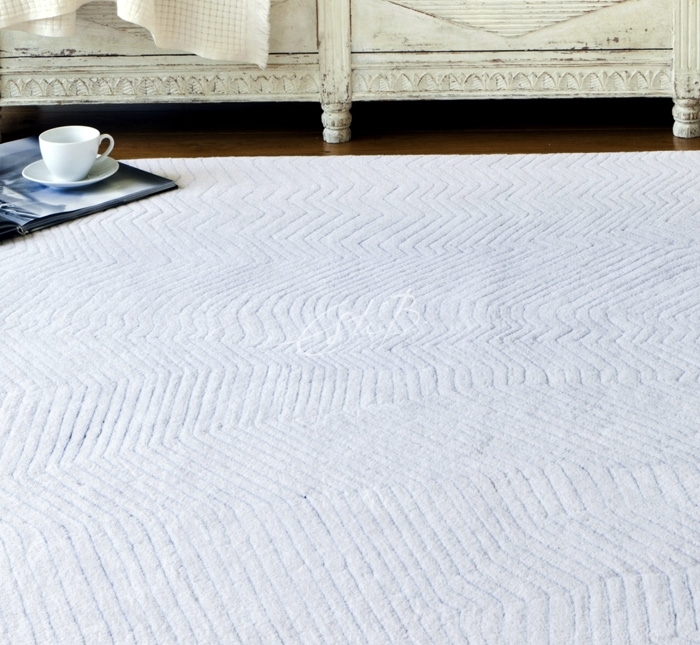 If you’re renovating a winter bolthole or are perhaps looking to inject some warmth into an existing scheme, TOPFLOOR’s timeless collection of bespoke contemporary handmade rugs, carpet and wood flooring could be the answer. To speak to us about a commission or to view our rug and carpet designs, contact us for an appointment at our Design Centre Chelsea Harbour showroom.